Tonight is Shabbat Shirah, meaning the Shabbat of Song. In the Jewish world we read the story of the parting of the Red Sea and the Song of the Sea that the Israelites burst into when they reach the other side, and which A. will chant and discuss tomorrow. Shabbat Shirah has become an occasion in parts of the Jewish world to present new or unusual music. To just make Shabbat especially musical. But capital-M Musical, as in "Broadway musical" – that is something our ancestors probably did not conceive of. But what a treat for us all, and what a gift for A. – at least I hope it feels like a gift to you, this great swim through the Sea of your musical theater tastes. When I was young, a Broadway bar mitzvah was not something anyone would have done. For me to indulge my own musical theater proclivities, I had to wait for a different rite of passage – the receiving of my driver's license, enabling me, at age 16, to head downtown to see a Sondheim show, and also, separately but no less importantly, to attend the Ann Miller film festival, which included a live on-stage interview, a complete showing of Kiss Me Kate, and the screening – twice – of her famous Great American Soups commercial. But, thankfully, A. did not have to wait for a driver's license, especially in a family of such supportive Broadway afficionados. In honor of Shabbat Shirah, and the Broadway Bar Mitzvah Extravaganza, I wanted to find the Broadway in this Parting of the Sea moment. Because Torah is really at the heart of what we're doing this weekend. This rite of passage has to do with Torah. The mitzvah part of Bar Mitzvah is about receiving and owning the mitzvot, or instruction, of Torah. As of this day, A. becomes responsible for Torah. Not necessarily to agree with it, but to value it. So that means engaging with it, wrestling with it, loving and hating it. But not being indifferent to it. So I asked myself how would Torah work as a Broadway musical? What kind of musical would Torah the Musical be? Our thoughts first go to Fiddler because, well it's Jewish. And indeed, in the Yiddish version of Fiddler, which is playing on Broadway right now (even on Shabbos) the song "Tradition" goes, di toyreh, di toyreh. Why do we live the way we live? Sheldon Harnick's lyrics say, "tradition". Important and quaint. But the Yiddish version is the more specific and heavily weighted "di toyreh" – Torah is why we are who we are. So that's cool, but it doesn't make Torah a Fiddler-like theater event. Because the sweep of Torah is so much greater, so much more epic and cosmic than Fiddler. It has a dose of the Age of Aquarius in its Creation story. It has the magic of Brigadoon and the tragic of Les Miz. It has rivalries, reversals, politics, migration, liberation and the consequences of liberation. The story is so big. The cast so large. The terror so present. The miracles so tremendous. The joy so unfathomable. Like "Into the Woods," we see characters with interlocking stories, taking journeys, going astray and, ultimately, facing a terrible foe. Pharaoh, or oppression itself, is like Jack's giant. Powerful, and seemingly unconquerable. But then the show heats up. A reluctant hero is found in the form of Moses. There are helpers in the form of Aaron and Miriam. Fear. Bravery. All ten plagues undoubtedly playing out in the course of one brilliantly staged number with countless dancers and extras. Then we head to the climax – the Israelites racing for the Sea. Pharaoh's army after them. Special effects – smoke and flame – all around. And at the Sea, when things seem most bleak, a great groaning and shaking of earth as God parts the water, in a reprise of a theme set up early in the play, when God split the waters in two to form heaven. This miracle of the Parting the Waters is so powerful that our legends tell us that in that moment every body of water parted. Not just the Red Sea, but every lake and pond on earth, every bathtub and glass of water. In the lobby of the theater housing Torah the Musical, they are undoubtedly selling water bottles divided in two in recognition of this. But anyway, back on stage the Waters part! The Israelites, still being chased, cross the Sea on dry land. They get to the other side, and as they turn back they see Pharaoh's army at their heels. The Israelites are outgunned, outmanned, outnumbered, outplanned. But wait! Suddenly the water rushes back in. An entire army, the most powerful army the world had ever seen, was destroyed. The Israelites stand there, bewildered for a moment, as the audience hears their own hearts beating. Suddenly, they surge into Song, the Song of the Sea, led by Moses and then by Miriam. Ozi v'zimrat Yah they sing. Mi chamocha ba'eylim Adonai! The chords swell to a climax. There are fireworks, and water getting shpritzed on the people in the first five rows. With a great final booming note, blackout. Curtain falls. Up come the house lights. Breathless, thrilled with the unanticipated happy ending, the audience stirs and stands. You look at your watch – it's so much earlier than you thought it would be! You'll be home in time to climb into bed and watch Netflix! You gather your coat and scarf, and that's when, just like when you saw "Into the Woods," your spouse pokes you and says, "Honey, you know that was just Act I, right?" You double-check the Playbill. Sure enough. There's a whole other act ahead. You go to the lobby for overpriced candy. You hear the ding-ding-dong of the intermission bells and go settle back into your seat. The lights go down and the curtain goes up. The Israelites are standing in exactly the same place they were at the end of the Act I finale. Except that now there is quiet. One Israelite pops up, "I'm hungry." There is a murmur of agreement. "The water is bitter," says another. The murmurs increase in volume as the obstacles get called out. "Why are we even here," the people ask. "We were better off in Egypt." They become annoyed at Moses, who is annoyed back, and God is annoyed at them all. As Act II unfolds, we find ourselves in the gritty aftermath of liberation. As George Washington once said – well, as George Washington said in Hamilton, "Winning is easy; governing’s harder." There are laws to learn. Lots of them. Ten biggies and hundreds of others, leaving some of the people feeling resistant. Some of the laws, in the big show-stopper called Leviticus, have a sting to them, that leaves people feeling bad. When you hear those bits, you want Miriam, someone, anyone, to stop the music and turn to God, singing, "Careful the things you say, children will listen." Act II continues to play out for a long time, for what feels like 40 years. There are setbacks and wanderings. There is also the birth of something holy. Something holy that comes to live with the people and accompany them on their journey. At last, old and venerable, at the age of 120, our hero, Moses, having passed his tests, and having passed the baton on to others, takes his last breath, knowing that the people are about to cross one more body of water and find home. And, we are told, in the show’s last ballad, that there will never again be anyone like Moses. Act II ends so differently from Act I. There is no great triumph. No spectacular and dramatic moment. But instead a growing sense of peace and promise. There is a wisdom in Moses and in the story, a wisdom grown from long life and intrepid journeying. Finally the curtain falls, and there isn't a dry eye in the house. There is elation, not because of miracles, but because of the beauty of life's journey, even with hardships and challenges. Quiet joy at the fullness that life can bring, and the holiness that can pervade it. 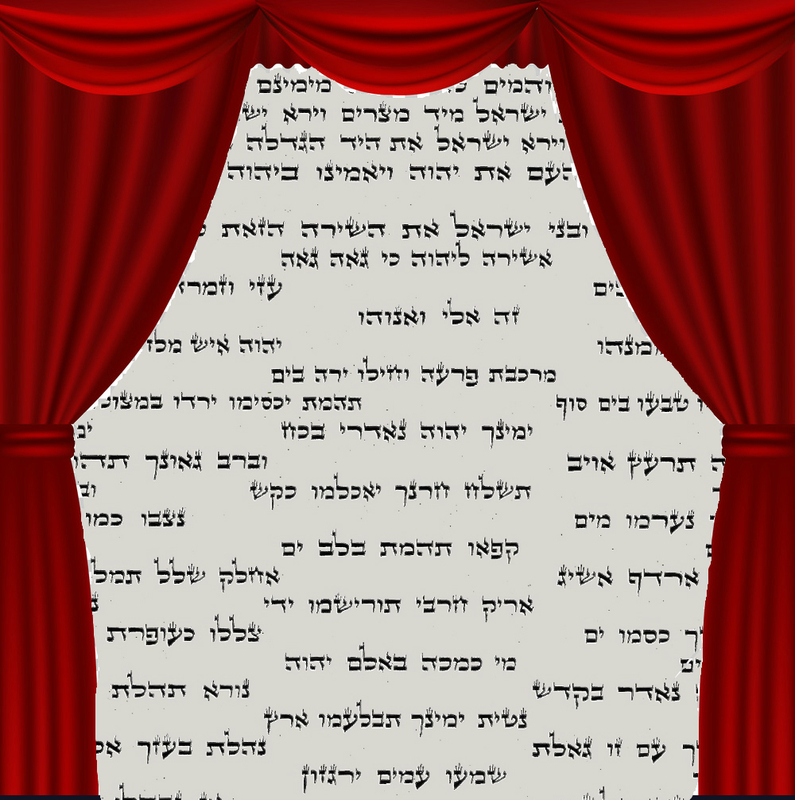 And so I turn back to you, A., because you are responsible for this bit of Torah, for the curtain-drop on Act I. And because this day will be a great triumph. We all know this. It will be a huge and memorable moment in your life. One whose melody you will walk out of the theater humming. And then, sometime soon, maybe instantly, the curtain will rise on Act II, an act that will not at first have quite the glamour of this scene we're in now. It will unfold over time. There will be much journey in it. Rules of life to learn and accept or to learn and reject. Adventures. Days that are exciting and days that are humble. There will be the business of school, of learning. Of trying new things. The business of love and friendship. Of finding your people. There will be dreaming. And letting go of dreams. And dreaming new dreams. There will be years of becoming wise. And years to notice the holiness that follows you around as you wander. There will be more big moments that could be the finale of their own Act I, and which will give birth to their own Act II. And at the end of the path you will be, we pray, like Moses, at a high place, able to look back and see the remarkable journey that you took and all that you have achieved, both the things you achieved with spectacle and pageantry, and the things you achieved quietly and intimately. And you will be able to look forward and know that you have prepared those who will come after you to continue the journey. Maybe not with the same humor and panache that you bring. But still. And you will know how loved you are and that there will never be anyone else quite like you.